I am so thankful for AC right now because North Carolina has been 105 the last few days. And the humidity has been killer! We had a couple of our friends over and everyone was feeling like a treat. So I asked one of the guys what his favorite treat was and he said Bongo Bars! I had never heard of them but he said they are a favorite in his family and I had to make them. 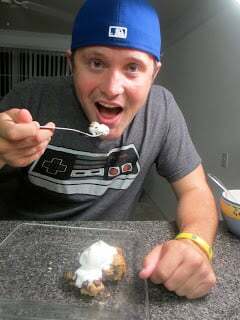 It is like a chocolate chip cookie brownie. 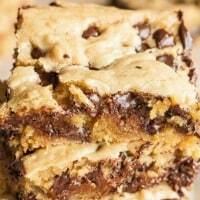 A delicious chocolate chip blondie that is simple to make! Melt the butter and mix it with the brown sugar in a large mixing bowl. Add the flour and baking powder. The mix will be crumbly at this point. Be careful not to overmix these! Add eggs and vanilla. Lastly the chocolate chips. Bake for 25-30 minutes. Enjoy! Thanks for the family recipe Jeremy! This looks like a good and simple recipe! 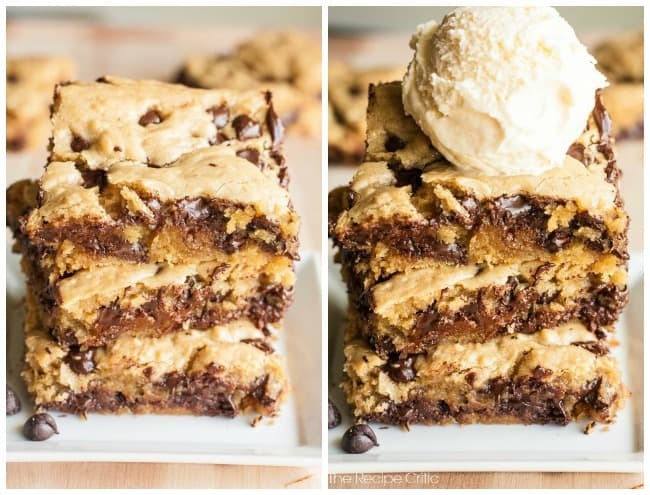 My teenage daughter just made something similar this week with a brownie mis and chocolate chip cookie dough! This look like a recipe, she will want to make! Thanks! These look delicious! Just wanted to drop in and say thanks for following my blog! Yours looks great as well. Thanks for dropping by the blog and following! I am following back via BlogLovin!!!! Looks like I have tons of recipes to check out here!!! Your recipes look so yummy especially this one. 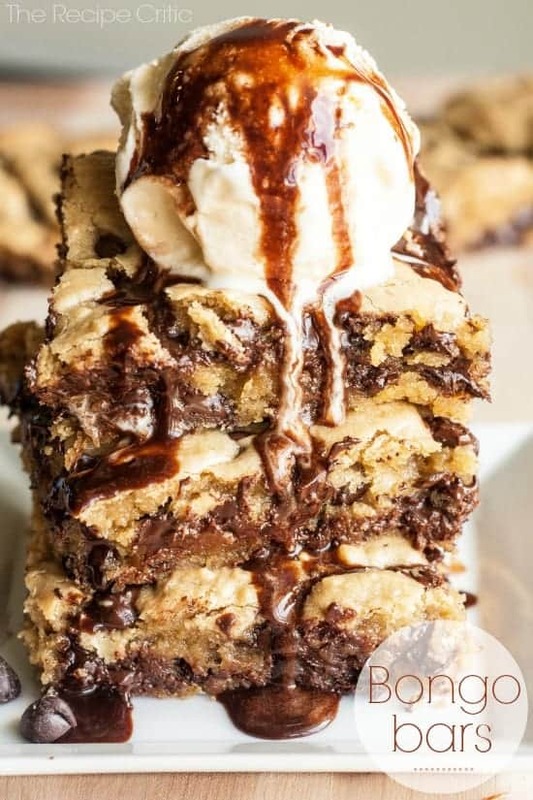 Cookies & Brownies I love, so this being kinda like a cookie brownie thing lol, perfect!! I’m very much a dessert person. I must try this!! Following your blog now because you make me hungry, n i love to eat lol. What size pan is this? Thank you! Yummy! Sounds like a quick, easy and delicious recipe for a hot day. Good grief Alyssa! These look incredible! Do you use self-rising flour? I have made an almost identical recipe called “Congo Bars” that uses butterscotch chips in place of the chocolate. I have seen ‘congo’ bars everywhere. But I guess his family calls them Bongo Bars! 🙂 Those sound delicious with butterscotch chips! I made this and it did not get like brownies, it was firm like cake. Any ideas why? I followed the recipe. The only thing that I can think is that they were overcooked or overmixed?? Sorry they didn’t turn out! I hate when that happens. They were amazing! Thank you for your reply!! What does over mixing do? And how much should i mix it? I made these last night for my kids and they were awesome!! Only half of a pan left!! I never heard of these but they look and sound amazing! Totally “pinned”! I also grew up knowing these as congo bars ( which oddly enough I made yesterday for co workers today ). But I have to say I love your name you gave them cuz frankly people do go bongos over them. At least my co workers do when I say I’m bringing them in. Hey Thank you so much for the delicious recipe.. It looks just wow!!!! Can’t wait to make that and indulge!!! I’m going to call the butterscotch ones by the Congo name and the chocolate ones by the Bongo name. That way I can keep straight which recipe my family is asking for? Brilliant, yeah??! Absolutely addictive recipe. These look amazing! I want to make these but firat do you have to change anything for high altitude? I was looking up a recipe for bongo bars. It is a favorite of my cousins. 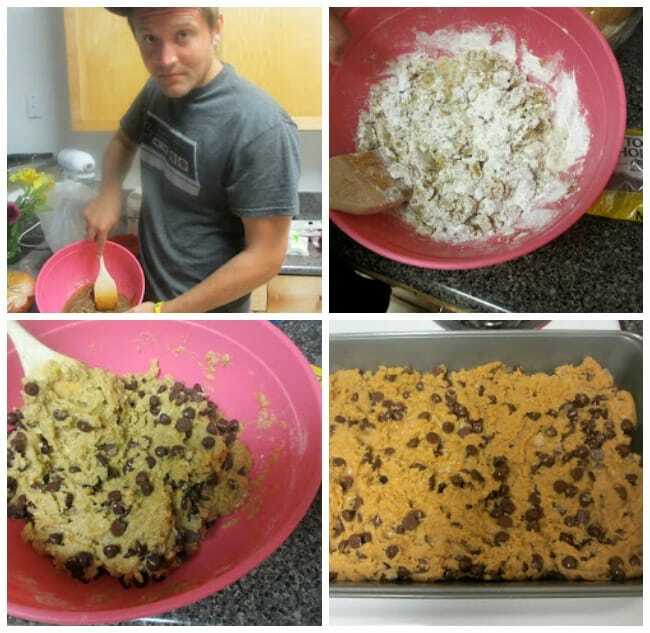 Only to see a picture of my cousin, Jeremy, on the recipe post. Crazy small Mormon world we live in for sure!